Coiste Chontae Liatroma would like to join in congratulating Dr. Frank Brady, New York on his nomination as the 2015 Leitrim Guardian Person of the Year. At a function in the recently refurbished Ballroom of Romance in Glenfarne on Friday night he was presented with his richly deserved award by last years recipient Eleanor Shanley. A former member of the Glencar Manorhamilton club in the 1970s, he travelled from New York with his wife Helen and daughter Sharon for the occasion. Among his many achievements Frank co-authored and published in 2004 (along with the late Joe McInerney from Aughavas) “A Century of Leitrim Football in New York”. 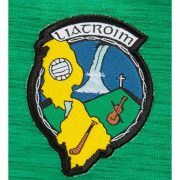 In addition to maintaining an active role with the New York club, he continues to support his native county through his involvement with the annual Leitrim Supporters Club Draw. Comhghairdeas le Proinsias. Copies of the 47th edition of the Leitrim Guardian magazine – Irelands only county journal – is available in shops now or online at leitrimguardian.ie and would make an ideal Christmas present.